Lowndes Adams was a close friend of my grandfather Mershell. He sang a solo at my grandparent’s wedding. I found more than a few news items about him singing at various events. Then I found this one in The Montgomery Times. 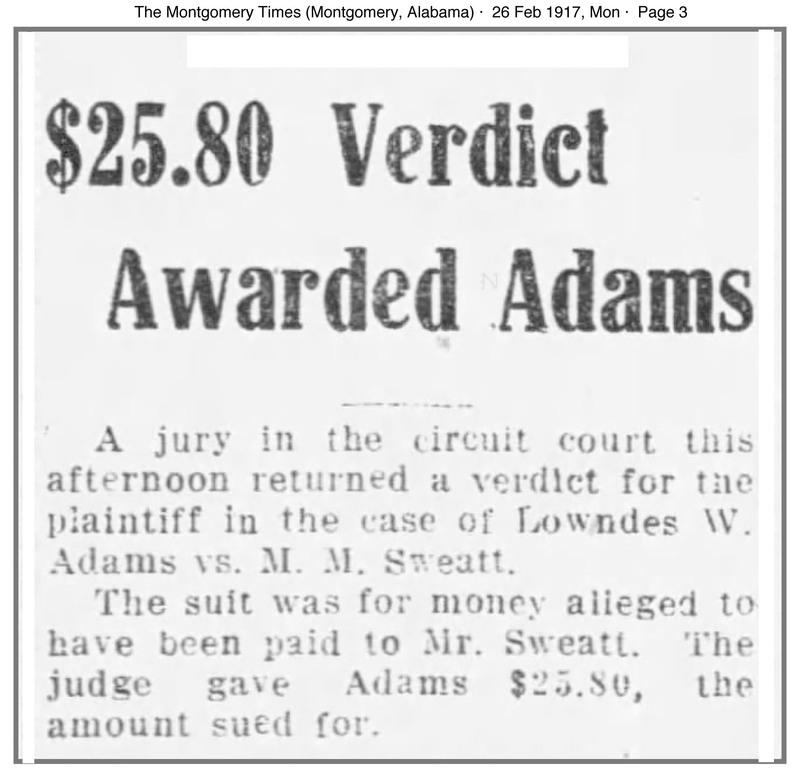 “A jury in the circuit court this afternoon returned a verdict for the plaintiff in the case of Lowndes W. Adams vs. M.M. Sweatt. 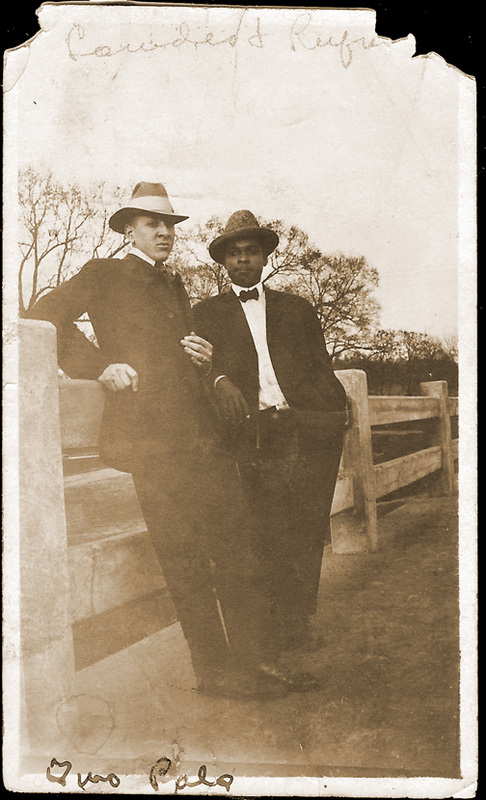 Millard M. Sweat was a white real estate agent. I was unable to find out what the case was about. While trying to find more information about that case, I came across a case in 1914 where an insurance company did not want to pay him and then this one in 1915 where he finally wins. In the list of applications for rehearings handed down by the supreme court this morning is the case of the Afro-American Insurance company against Lowndes W. Adams. It seems that Emma Broadnax had her life insured for the benefit of Lowndes W. Adams. 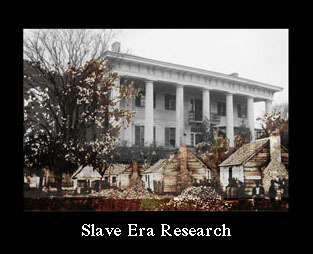 The Afro-American company alleges that the papers filed with the company gave the name of Adams as a grandson of Emma Broadnax and when she died the company refused to pay the insurance on her life, alleging that she did not set forth the facts in the case, as to being related to her. The supreme court held that Emma Broadnax had the right to insure her life for whom she pleased and rendered a decision in favor of Lowndes W Adams for the sum of $542.42. The Afro-American Life Insurance company made a motion for a rehearing. The court this morning declined this motion and Lowndes W. Adams wins his suit against the company. Emma Broadnax was rooming with the Adams family she died October 1, 1913. I found very little about her, two directory entries and a death record. The $543.43 she left Lowndes would be worth $13,264.21 in today’s money. Lowndes’ father died in 1909 when he was eighteen years old. Both of his brothers were dead by 1900. He had two older sisters and three younger ones. He completed high school and worked as a a porter, a stenographer, an agent for the Avant Company and eventually at the Ford Factory when he moved to Detroit. Here is a letter that Lowndes wrote to my grandfather Mershell after his move to Detroit. Really I had begun to say little mean things about you, for it did look like you were going to take as long to write as you did when you first landed in Detroit. You may know what a pleasure it is at all times to receive a letter from a friend and pal. Well, Cliff and Chisholm are there and how do they like Detroit. Tell Chisholm I know he will conserve a week looking at the skyscrapers and be sure to hold him when he is taken out to the lake. It was a great surprise to know that he left with Cliff, as no one seemed to have been aware of his leaving until several days back. Of course there is no need of advertising your intentions, but he and Cliff both got away without my knowing. We have been having some real cool weather for this time of the year, and it has caused everything to be unbalanced somewhat. Yes, I thought strongly of leaving this place on account of the depressing standing of our business and since it has changed for the better, I think I’ll stick a little longer. I thought that my leaving would have been compelling from that point of view. Edgar is home now, the Pullman Company gave him a run out of here to Mobile so he has transferred here. He told me that he saw you and so many others that he knew and all seem to be getting along fine. Say, I want you to write me if you should see anything that you think may interest me. Have you payed any attention along the typewriter lines; and should you see anything in the papers concerning this particular line of work – send it to me. 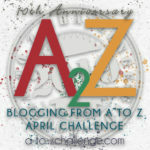 I wrote about Lowndes for the 2016 A to Z Challenge and you can read that in this post Ula Mae’s Uncle Lowndes Adams. I also wrote about him in Lowndes Adams Found in 1965 and Three Men in Hats. 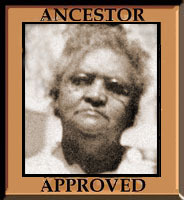 I found this information on Ancestry.com in Census Records, Directories, Death Records and Military Records. The news item was found on Newspapers.com. The photograph and letter are from my personal collection. I was glad to see he won too. And surprised. I wonder what he meant by looking motherless. Did they look disheveled in wrinkled clothes or something? It sounds like Lowndes liked to tease people. I think he meant lonely, sad and forlorn. The men in these photos don’t look like they’d ever be seen in wrinkled clothes. So many people were moving North, their “crowd” had shrunk. What treasures of family history. Those are two dapper looking men indeed. I love those photographs of my grandfather’s friends. I love these newspaper items! So many things I never would have suspected. They are a great supplement to the records. Lowndes Adams was a very popular singer around town at various events. He must have had a beautiful voice. I am glad he won his lawsuits. Insurance companies will try very hard not to pay up. They certainly look dapper young men. I agree on all points, Anne. It’s interesting how the types of stories that newspapers publish have changed across the years. Years ago there were so many more stories that reported on events (like the insurance settlements) that involved people in the community. I wonder what he did with the settlement. Glad he won the lawsuit – 542 dollars must have been a neat sum those days! It was worth $13,264.21 in today’s dollars, according to an online source. I wonder what he did with it.